Regardless of the channel of contact, the words CSRs use when interacting with customers are a critical success factor to a great Customer Experience. There is a huge risk to the Customer Experience when CSRs are focused on CAN’Ts. Can you think of a couple of reasons why that is? I can … Customers want solutions to problems! They want action, attention, caring, empathy, confidence, etc. When met with lists of obstacles, customers feel frustrated. Frustration fuels escalations, delays, ugly social media blasts, reductions in retention, and potential loss of market share which ultimately damages profitability. So I am asking that positive word choice be considered a strategic communication option – a must-have rather than a nice-to-have. My work takes me to many Contact Center operations in a variety of industries. I am privileged to witness many interactions and transactions with customers. There is one simple phrase I believe can greatly assist customers, trainers, and ultimately CSRs when responding to issues, concerns, and problems … “Here’s what I can do now.” It is simple, to the point, and keeps the CSR thinking in terms of possibilities. Imagine this phrase as a central component of CSR education. What would be the yield? Building ongoing scenario-based discussions around the use of this phrase has tremendous potential. The power in this phrase is twofold. First, it cues the CSR to think in terms of what CAN be done as opposed to what CAN’T be done. As well, it offers the customer a positive option to explore. Customer Care is about problem solving and so far in my life experience CAN’Ts don’t solve problems; CANs do. It often seems to me, both as a consumer and as a consultant, that CSRs (and perhaps supervisors, managers, and beyond) have a tendency to focus on the CAN’T rather than the CAN. Why this is I am not certain. However, it can be tracked to a variety of elements. Perhaps more training time was allocated to “rules and regulations” (aka policies and procedures) around handling issues; perhaps the general perception is that customers are “trying to take advantage,” and perhaps it is just easier (i.e., makes calls “faster”) to just deny the request and escalate. There may be a knowledge gap or a fear of reprisal, or it could just be a bad habit. The origin is unclear but the reality is undeniable. My thinking is that if education included a distinct leaning towards “Here’s what I can do” it would spark and foster critical thinking. Communication practices where conversations are guided through the lens of delivering possibility (CAN) provide for a more thoughtful engagement … a “branded experience” which contributes to the desired Customer Experience. 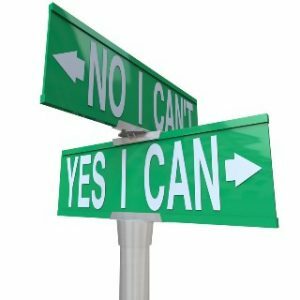 I am not saying that using CAN means saying YES to every request made by a customer. However, regardless of the absurdity of a request, alternatives do exist. CAN behavior expands beyond the actual phrase, “Here’s what I CAN do.” The phrase acts as a catalyst to the CSR in terms of their own response to a customer who is frustrated, anxious, disappointed, etc. What goes on behind the scenes (that is, in your head) carries an enormous amount of weight when it comes to what comes out of your mouth. The CAN phrase may act as a communication “filter” to minimize reaction and maximize pro-action. Consider the power of questions rather than inflammatory CAN”T statements (e.g., “I can’t”, “they won’t allow it”, and “no one else has had this problem”). Asking customers additional questions rather than leaping to telling what is not possible (and often interrupting the customer mid-phrase) softens the conversation. Open-ended questions work best, for example … “May I ask for additional details around X?”, “Would it be alright if I …?”, “Are you familiar with our X?”, and “What would it take to make you feel better about the experience?”. Once we enjoy genuine clarity around the situation, the ability to identify the true source of frustration is enhanced. This allows for a more targeted CAN response …”David, I CAN understand your concern around the amount of time this has taken; here’s what I CAN do now.” Even when the offer is totally contrary to the request, a new discussion emerges. In this case, the CSR has asked questions and discovered that the actual situation is not causing frustration. It is the time it has taken! What a totally different driver. It is impossible to identify all scenarios and (yes) there are times when customer requests will be denied. It is in the manner in which these encounters are handled where change and experience management reside. Change comes in terms of internal communication filters. For example, I have had many discussions with CSRs in which their beliefs about customers are contextualized in disdain … “They are a bunch of whiners”, “Why should we give in to THEM?”, and “They are always trying to get something for nothing”. Interestingly, these types of comments are lodged in personal beliefs rather than as a representative acting on behalf of their company. This is further demonstrated via the escalation phenomenon. A customer encountering a forceful CAN’T often seeks escalation to a supervisor or manager; they may even contact headquarters. In these situations, the complaint is aired to a new audience. The customer may be granted an exception, often based on the “experience” the customer had in getting to the escalation point rather than due to the actual event. This further annoys the front line because there is a feeling that they were “following” the policy (rules) and the decision has been overridden. An exception is often made to accommodate the manner in which the policy was applied as opposed to the policy itself. Of course, there are exceptions. We have all traveled through the inconsistent application of policies and procedures that is an irritant to the front line. Management must address this issue by establishing consistent guidelines for the application of policies as well as criteria for exceptions. Studying escalation profiles offers tremendous insight into whether the customer issue is one of application or of communication. Consider educating, discussing, and adjusting communication skills for all involved in the Customer Experience to focus on “Here’s what I can do NOW.” Adding “now” to the phrase adds power and immediacy; few customers will object to at least listening to the options. And an entirely new conversation begins. The Customer Experience is a communication-based event and the effectiveness of CAN over CAN’T is a very powerful tool.